A small but select choice from the available information. 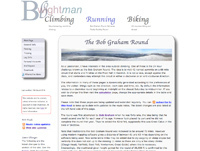 42 Peaks - The Story of the Bob Graham Round - Revised Edition 2007 - Roger Smith, Paddy Buckley and Brian Covell. Available from various fell running retailers. See the Club's Guidance Notes for details. Stud Marks on the Summits - 1985 - Bill Smith - Various Chapters in Part Three. Out of print and quite rare. Feet in the Clouds - 2004 - Richard Askwith. Also available in paperback. In addition there is quite a lot of discussion of Round attempts on the FRA forums. History and Records of Noteable Fell Walks 1864-1972 within the Lake District with supplements for 1973-74, 1975-76 and 1977-78. Fred Rogerson produced 100 copies of this monumental work: doubtless a few still exist! Fred has a hard copy. The Club has 2 copies on disc to secure the work for the future in case all the hard copies are lost or destroyed. The Chairman has one of those, and the Secretary has a hard copy. If anyone wishes to consult this amazing historical record, you can contact either of us.